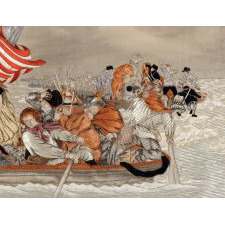 Dimensions (inches): frame - 39.75" x 54", work - 30" x 44"
Between roughly 1885 and 1915, American sailors visiting the orient could obtain beautiful needlework embroideries on shore, with patriotic American themes. These extraordinary works of art were acquired as mementos of a long voyage, often with the hope that they might be presented as gifts for loved ones and friends. 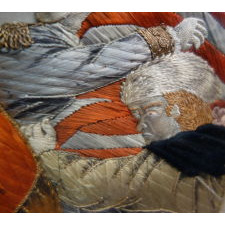 Typically the materials employed included silk floss, elaborately embellished with silver or gold metallic bullion thread. 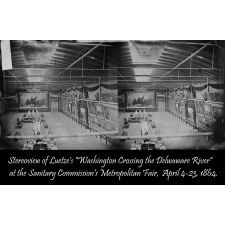 They were constructed with a combination of various types of embroidery work and stitchery, by artists working the piers in port towns, who would create views customized to the buyer's content. The most common illustration was an American eagle, rendered on a dark ground, usually of velvet or silk. Commonly these included one or more American flags, a federal shield, sometimes integrating various maritime elements. The work might then be personalized with names or initials. On scarce occasion they included locations and a date. The most often countries of origin were China and Japan, though various other nations throughout the orient are not uncommon. Some examples include open windows where either photographs, usually of the sailor or his ship, or other media, such as small paintings or lithographs, could be inserted. Larger works could be purchased were usually much more elaborate, vertically-oriented, with one to four windows for inserted images. Variations from the norm include state seals instead of national emblems, or international flags and symbols. 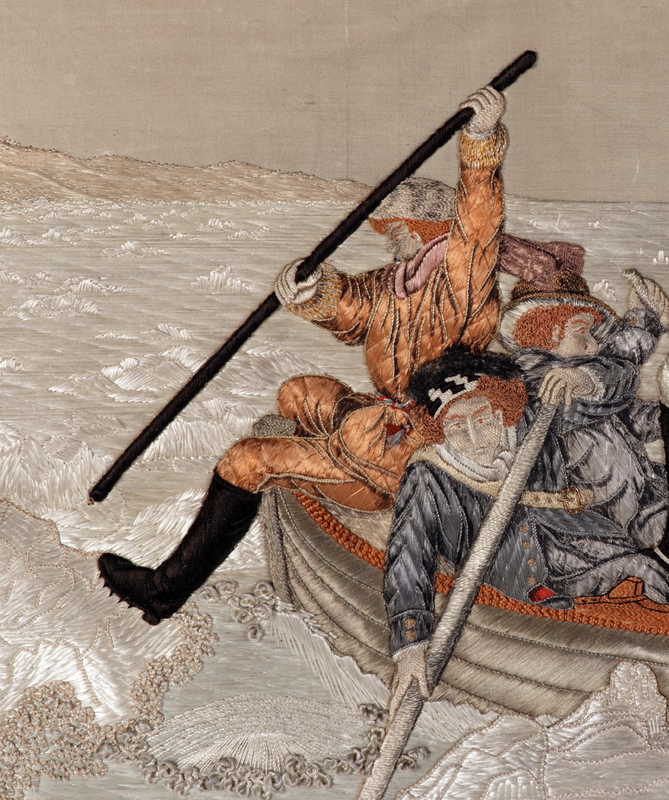 This particular work shares many of the tell-tale types of silk and bullion embroidery encountered on most sailor souvenirs, but that is where the similarities end. 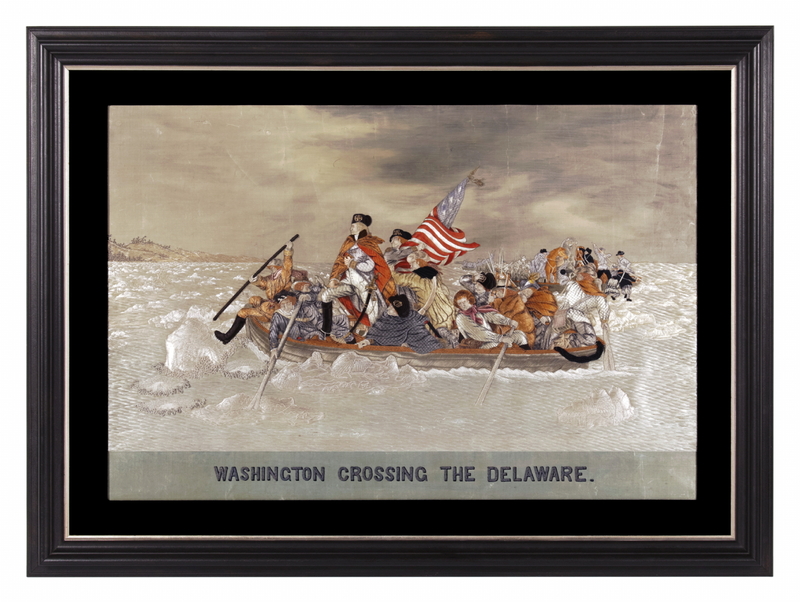 Horizontal and larger than any other of the form that I have ever seen, the illustration reproduces Emanuel Gottlieb Leutze's painting of Washington's Crossing of the Delaware River. While I have seen hundreds and hundreds of examples over the years, I have never anything entirely composed of a landscape view, or that reproduces famous artwork. Light overall in color, instead of dark, the appearance is very different from the norm. 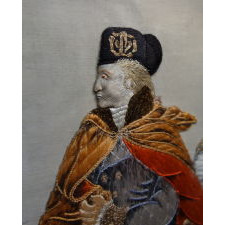 It is also rendered on paper, with the sky completed in pastels, a trait that is unique to this example in my experience in the private marketplace for antiques. 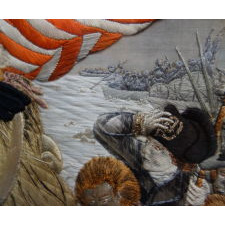 While the entire composition was achieved with extraordinary skill, using a wide array of stitchery, the most outstanding feature is the stuffing of the fabrics, which significantly impacts its appearance. Called trapunto work in quilting, this form of artistry involves raising various elements from behind to make them three-dimensional. The skill in which it is accomplished, and the degree to which the surface is lifted, determines the results. Here the artist employed the technique with great expertise and to wonderful effect, embodying the figures with lots of character that a two-dimensional work cannot easily convey. 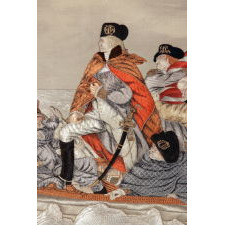 Much of the river, the clothing, and the canton of the flag are executed with satin stitches (linear and parallel), and quilted in a diamond pattern. 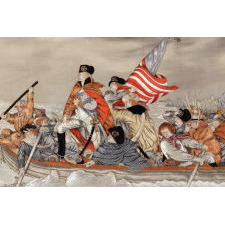 The hats, hair, faces, boots, swords, the stripes of the flag, the sides of the boat, pole, and oars, are done in a similar manner, though tighter and without quilting. 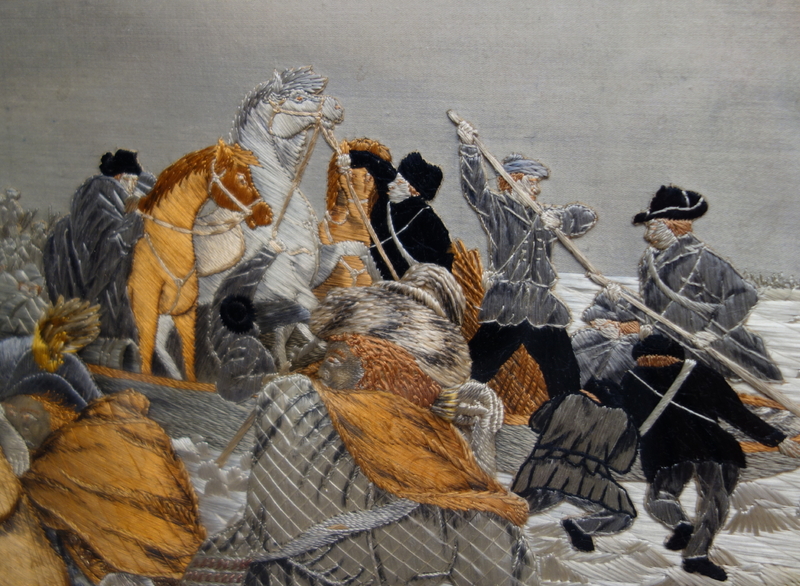 Icebergs are achieved by running satin stitches in various directions, slightly altering the style, then separating the areas with dot-sized backstitching. Different types of knotting create the froth and the foliage on shore. 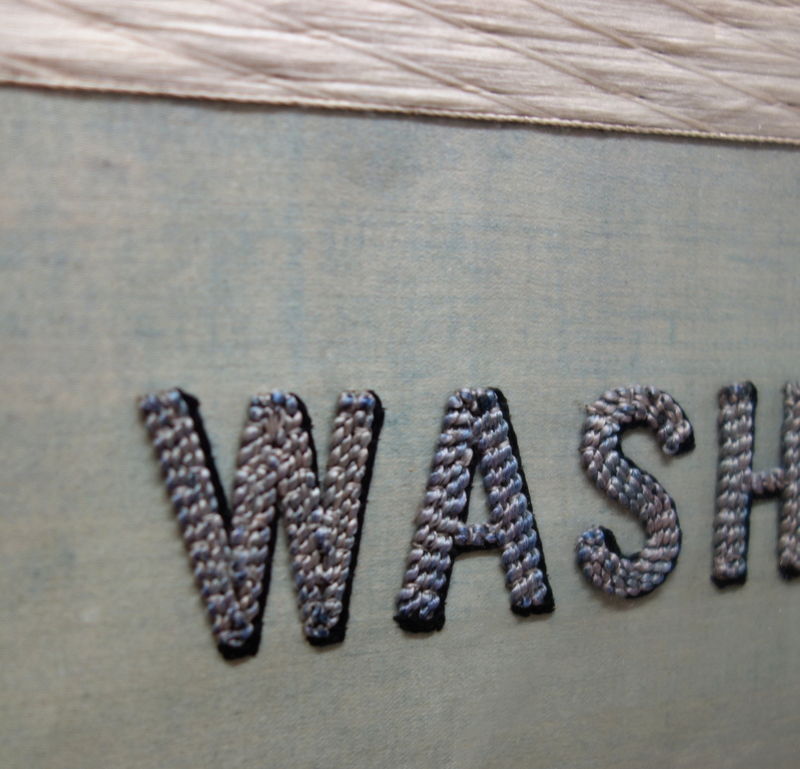 Chain stitches are used along the edge of the boat and to create the title of the work along the bottom register. Bullion is used liberally for embellishment of metallic objects, such as hat and uniform insignias, the hilt and sheath of Washington's sword, his spyglass, and the finials and tassels of the flag. The colors include shades of copper, red, rose, blue, silver and gold, in addition to black and ivory. The faces are interesting and carefully shaded with great expression. 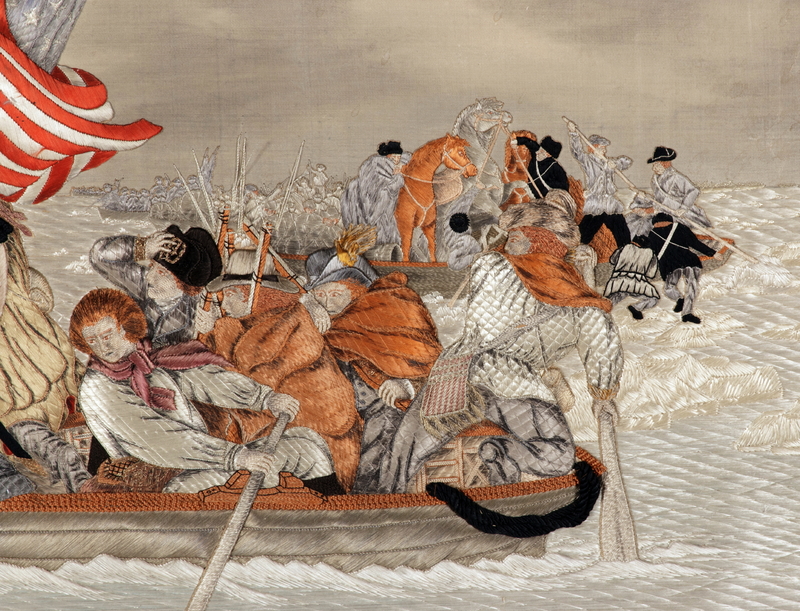 Even the tiny details of the men and boats in the background are expertly rendered. I expect that this work was not done abroad, but here in the States, in a Chinese or Japanese pavilion at a world's fair. It was common at World's Fairs for weavers and other artisans to display both technology and hand skills before onlookers, and to offer the goods they produced for sale to attendees. 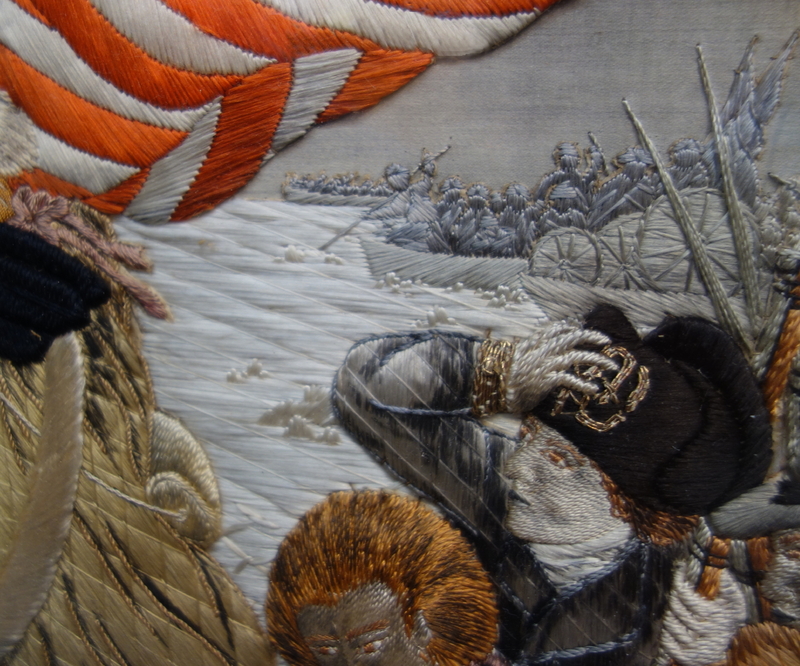 Textile-related objects ranged from embroidered ribbons to loom-woven coverlets. Something of this depth and scale would have been costly and not for the average fair-goer. 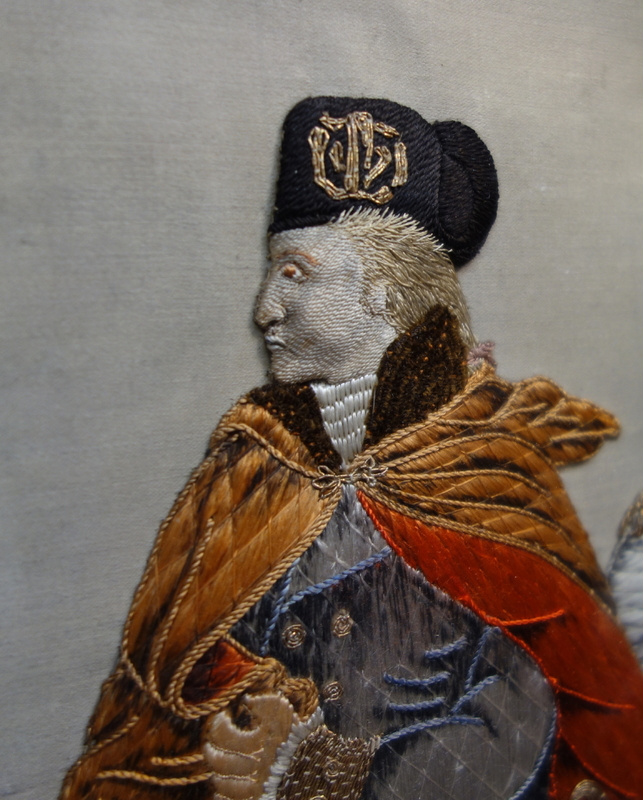 The combination of raised trapunto, thoughtful and complex embroidery with excellent contrast and texture, beautiful application of both vibrant and complementary colors, results in a masterpiece of 19th century needlework. Leutze's original illustration, rendered in oil-on-canvas, captured the image in the German-born painter's mind of what we now know to be a mythical scene. 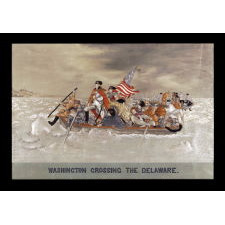 Modern research shows that Washington and his men were on a group of make-shift rafts, assembled for the arduous task of crossing the frozen river on Christmas night, 1776, to surprise the British at Trenton. Historically accurate or not, what Leutze did manage to convey very well was a combination of the small scale of the operation, yet the enormity of the forthcoming victory. He also translated the heroic determination, competence, and charisma that were characteristic of Washington's, who had by this time achieved legendary stature in the American consciousness. Enormous in scale, the original work, completed in 1850, was largely destroyed in a fire in Leutze's own studio, then after restoration, became part of the collection at the Kunsthalle in Bremen, Germany. It was finally destroyed completely in a British air raid during WWII, in 1942. The irony of the loss led to a persistent joke that this particular raid was Britain's final retaliation for the American Revolution. 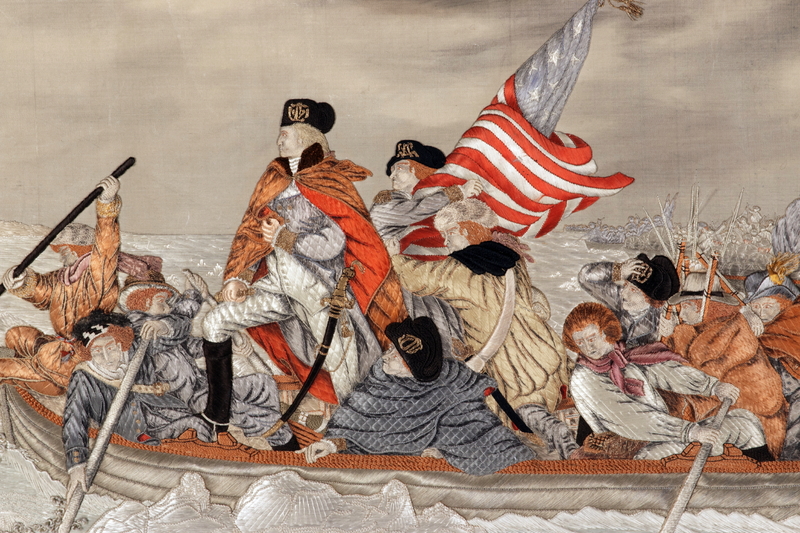 Upon the urging of Parisian-American art dealer Leon Goupil, who maintained a gallery on Broadway in New York and was very successful with American historical works, Leutze painted a second, full-sized replica (12' 5" x 21' 3") shortly after the completion of the first. 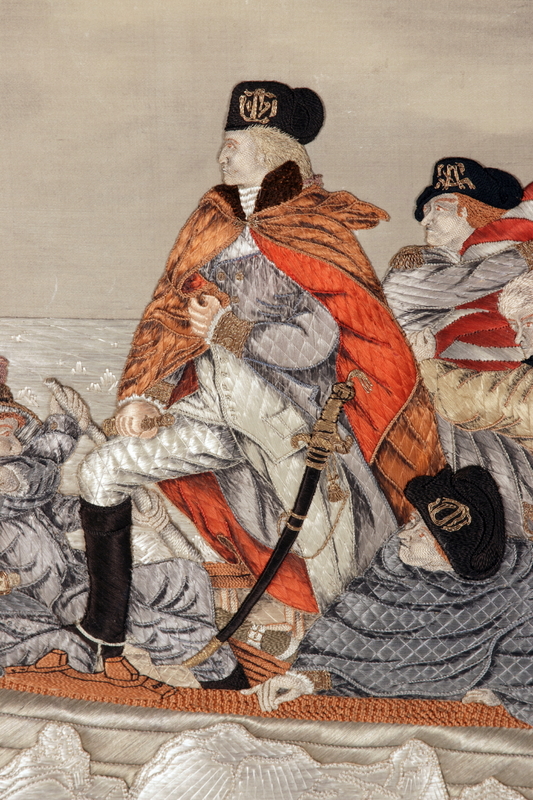 Colonial and Revolutionary American personalities were enormously popular at the time. Begun in 1850, the painting was placed on exhibition in New York in October of 1851. Despite the fact that it was a one-painting show at the Stuyvesant Institute, more than 50,000 people paid to view it--a simply enormous attendance for the time. It then went on view at the United States Capitol, where it was received with the same enthusiasm. Goupil brokered the work to Scottish-American businessman Marshall O. Roberts, who lent it for display just once for exhibition at the 1864 Sanitary Commission's Metropolitan Fair in New York City. Held during the Civil War (1861-65), this was a fund-raiser dedicated to field hospitals and the care of wounded soldiers. Attendance over the 18 days of the fair's duration, from the 4th to the 23rd of April, was estimated at 100,000, and the intake was more than $1.3 million, eclipsing all other Sanitary Fair events. 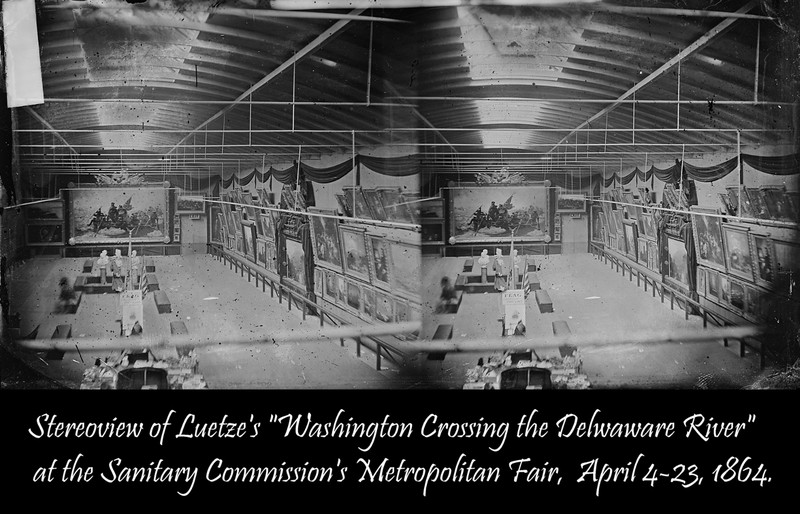 According to the Metropolitan Fair exhibition catalogue (Leutze served on the art committee), three other generals are identified in the image. 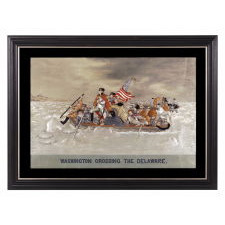 Behind Washington, holding the flag, is General James Madison, the future president. Below him, hanging over the edge of the boat, Nathaniel Greene, and behind them, holding onto his hat, is Edward Hand. The remainder represent a cross section of the American populous. Half of the board members of the Sanitary Commission were key members of the Union League Club of New York, of which Leutze was also a member, as was Marshall Roberts. The Union League sponsored the fair, which was orchestrated by Mrs. Jonathan Sturges, the wife of its president, and took place next to the club, adjacent to Union Square. 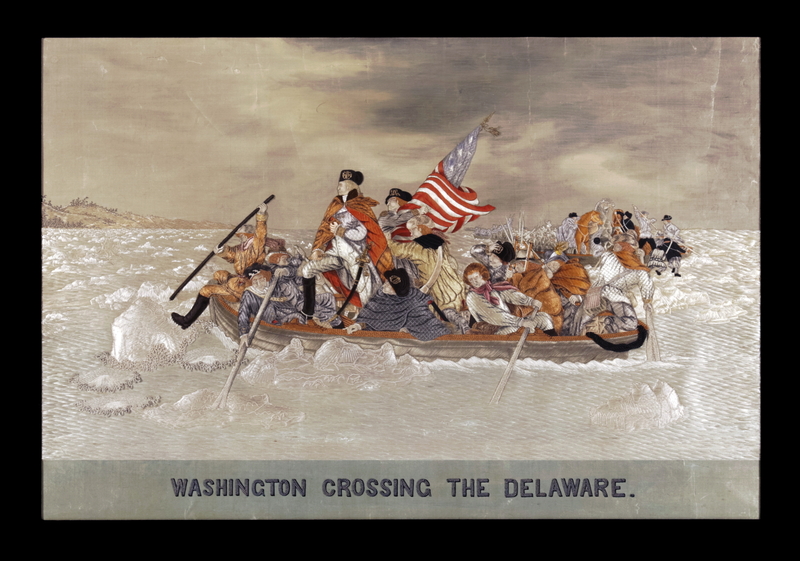 Exhibited along with many other works, Washington's Crossing was the first item in the catalogue, with a two-page write-up, and the gigantic painting was dramatically positioned at the end of the hall. In 1870, about 25 members of the Union League, led by John Jay (grandson of the American founding father), helped found the Metropolitan Museum. Roberts passed in 1880 and the painting remained in his estate until 1897, when it was sold at auction and purchased by another Union League member, John Stewart Kennedy, for immediate donation to the Met, where the painting remains today. It is of interest to note that a third version, just 5 feet in length, once attributed to painter Eastman Johnson, is now correctly identified to Leutze. Displayed for 35 years in the West Wing reception area of the White House, it is now in the care of a museum in Minnesota. Mark Twain [remarked] that every grand home along the Mississippi River between St. Louis and Baton Rouge had over its mantel an engraving of "Washington Crossing the Delaware" or "on the wall by the door [a] copy of it done in thunder-and-lightning crewels by one of the young ladies--[a] work of art which would have made Washington hesitate about crossing, if he could have foreseen what advantage was going to be taken of it." 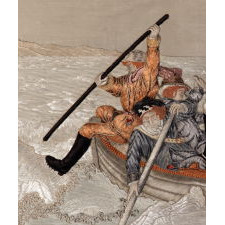 Despite Twain's remarks, the only similar work I have located to this embroidery, also of oriental manufacture, is in the collection of Washington College on Maryland's Eastern Shore. The only probable schoolgirl rendering of this view, much more crude and child-like, though similar, in the collection of the Fenimore Art Museum at Cooperstown, NY. 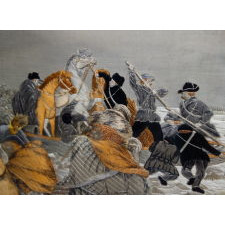 Copies of the painting exist in two-dimensional, Berlinwork needlepoint, produced as kits in Nuremberg, Germany and sold in the States, to be stitched by the buyer. I was privileged to own one of these, which are likewise exceedingly rare. 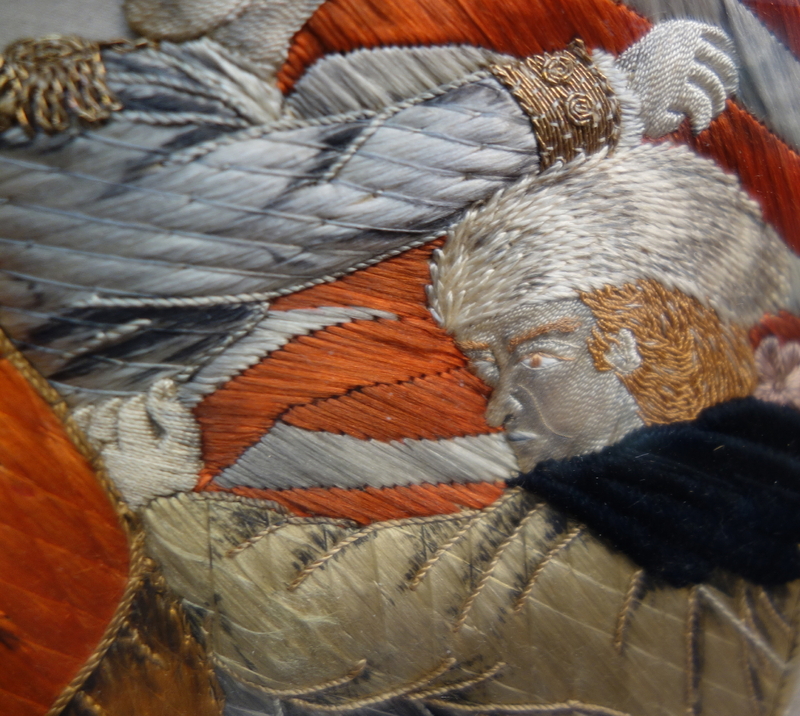 Mounting: The textile was framed within our own conservation department. 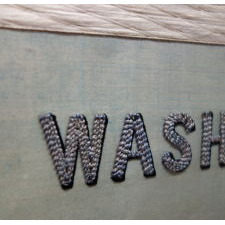 A triple-thick mat was used, beveled at an angle and covered with 100% cotton twill, black in color, that was washed and treated to reduce and set the dye. The black-painted and gilded molding is Italian and of exceptional quality. The mount was placed behind U.V. protective plexiglass. Condition: The textile is in tremendous shape and intact, with original color well preserved in all but the blue background in the lower register, where the title is located, which has significantly faded but is very attractive. The work, on its original paper backing, was found adhered to modern cardboard. Our conservation team was able to remove it. It was adhered it to 100% cotton rag board with archival adhesive for stability. Several fractures occurred in the sky area where the adhesive was the heaviest and the paper was the weakest. Careful handling resulted in no significant overall parchment loss, though slight pastel restoration was necessary. The perimeter had a very small amount of damage and loss, easily covered by the mat without any effect on the overall image. Splits in the lower register were easily stabilized with the new mount to rag mat.